Fiat has done it again. 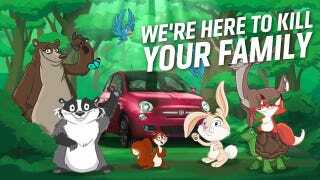 The latest in an endless string of horrible ad campaigns is a group of Disney knockoffs threatening would-be buyers with death and dismemberment if they don't pony up the cash for a new 500. When will it end? The new minute-long spot, cooked up by ad agency Doner and set to be played on gas pumps teevees this month, features a cast of lovable characters that implore the viewer to buy a Fiat, before the whole mood turns dark. If you're keeping track, Fiat kicked off the 500 in the U.S. with those atrocious Jennifer Lopez spots, followed by "The Italians Are Coming", the Charlie Sheen idiocy, some truly awful Godzilla tie-ins, and finally the moronic GIFification of buzzwords and three-year-old memes targeted towards some prototypical Millennial that only exists on corporate whiteboards. Which is all too bad, since most of us really like the Fiat 500 (hell, I almost bought a 500E). But then again, maybe they're working. They're getting attention, and I just wrote about them – again. Dammit.